Michael wanted to change the world, one person one song at a time. For many of us, he did. 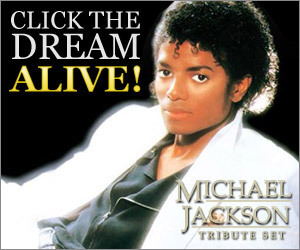 Keep the dream alive with our Full Color Print Michael Jackson Tribute Set. Now you can remember the King of Pop with two of his most famous and endearing photos. This set include a special edition print of Michael’s global phenomenon Thriller cover which changed the history of music forever selling over 50 million copies. Plus, a must-have collectible memoriam print featuring Michael in his legendary regal attire and his loving message to the world. This Michael Jackson Tribute Set is the only collectible authorized by the American Historical Society.